Product #33374 | SKU DJM600 | 0.0 (no ratings yet) Thanks for your rating! 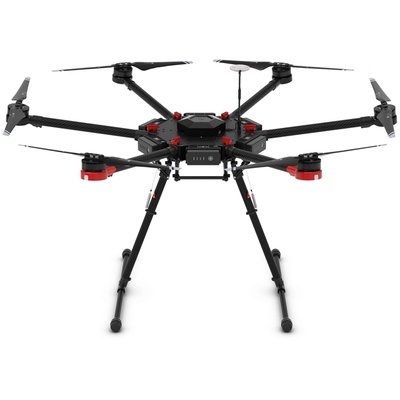 Supporting a total takeoff weight of 15 kg, the Matrice 600 (M600) is a hexacopter from DJI designed for professional video and industrial imaging applications. It is centred around DJI's advanced A3 flight control system and incorporates the Lightbridge 2 system for HD resolution, low-latency monitoring via SDI, HDMI, and USB outputs on the controller. For camera support, the M600 works with Zenmuse Z15 series gimbals, the Ronin-MX gimbal, and Zenmuse X Series gimbal/camera hybrids. Note: Hovering time is based on flying at 10 m above sea level in a no-wind environment and landing with 10% battery level. Get 6 x Free TB47S Flight Batteries when Purchasing this Matrice 600. Only Valid for single stock unit!